Blog / How to Make Sure that PPC Marketing Will Work for Me? Digital marketing of today has a large number of advantages, among which are the delivery speed, high level of targeting, manageability, stats accuracy, and of course – variety. You can focus on social media marketing, email marketing, lead generation, influencer marketing and much more. So when you can choose between a large range of digital marketing strategies, how do you find out which one fits your business the best? PPC, or pay-per-click, Marketing became one of the most popular, effective and high-return online marketing services of today. Why so, you would ask? It is for a number of reasons, which we will name and explain in the following section. Among other reasons we’ll name further, PPC Marketing is largely popular due to its democratic payment option – the only time you pay is when your customer clicks on the direct link to your website. And as opposed to other marketing strategies that require time, money and resources being spent with only a small amount of expenses actually resulting in generated leads, pay-per-click marketing is all about that. You only pay Google AdWords advertising when a customer, interested in your product, is directed to your website. On the contrast, to say, social media marketing, that distributes content for a large number of people aiming to find the right auditory within them, pay-per-click marketing is narrow-targeted. It means that only people already interested in your product or services will see your ad. Google algorithm shows your pay per advertisement only to the users who are searching for what your business has to offer. This way you already tap into your target auditory without doing much background work on building the right customer profile and researching. It’s an undeniable fact that the success of your future campaign depends on analyzing you’ve done with your past advertising. Tracking of your campaign progress and results allows you to remove what’s not working, embrace what is, and optimize for the best results in the future. And who can do a better job on tracking each and every aspect of your campaign if it’s not the king of Search Engines – Google Adwords. Pay-per-click campaigns give you the full range of metrics, indicators, and tips on improving your advertisement for the best performance outcomes. And that’s exactly what you want. Now that we established the benefits of the pay-per-click campaign, how do we make sure it will be effective for your business? PPC Marketing works magic for almost any type of business regardless of your goals – wherever you need to get more eyes on your website’s content, more phone calls or more actual in-store visitors. The best way to achieve desirable results is by optimizing your PPC ad campaign and factors that directly influence their performance. Follow these 3 steps to be sure that your Google pay-per-click ads will be high-ranking, high-performing and cost-effective. If you have worked with other advertisement platforms, you will know that Google Adwords advertising works in a whole different way. Unlike Facebook, where you set a daily or a period-long budget which stretches over the duration of the whole campaign and can never be overspent, GoogleAds work in a whole different way, and to succeed at launching campaign in this space you’ll have to know the ins and outs of the system. Firstly, let’s figure out how the budgeting is done withing pay-per-click campaigns. To begin with, you have to determine a variety of keywords you want your ad to appear for. You can set a daily budget and redistribute the whole amount for each keyword. This strategy will allow you to monitor how each of your keywords performs, remove the costly and underperforming ones, and increase a bid for well-performing keywords. After this initial process is done, each of these specific keywords and keyword phrases is assigned a budget-per-click, which means a maximum amount of money you are willing to spend per one ad click. So, for example, setting a 6 dollar mark will not mean you will spend 5 dollars per click, but will mean it will cost anything up to $6 depending on your quality score. For instance, having 121 clicks for the keyword phrase will not result in a $726 expense, but will cost you $485,21 because of the Google Ads ranking your cost-per-click dropped to $4,01. Setting your campaign budget will not only let you easily monitor the performance of each ad, but will also keep you in charge of your expenses throughout the whole pay per click internet marketing process. So why is there a maximum instead of a fixed price for a pay-per-click bid, you would ask? It is there because of the Google Adwords ranking system. Since Google AdWords is an extremely honest advertiser, just increasing your pay-per-click budget will not guarantee you a high rank. Google strives to provide the most relevant, high-quality content to its visitors, even and especially when it comes to ads. When you upload your PPC ad campaign, you compete with other advertisers aiming for the same keyword. So if your competitors have a higher maximum price point per keyword they will be placed in the search engine higher? Not necessarily. Ad ranking includes a number of factors which will determine both – which place you will actually end up getting in the search list and how much your click will cost. Essentially your ranking consists of two things: max bid per click and your quality score. We already know about the max bid per click from the previous section, and will review the second part of the equation here. Your quality score is a summary of the relevance of your ad, expected click-through rate and your landing page experience. The first one is self-explanatory, while the last two points require more clarification. Expected click-through-rate, according to Google “predicts whether your keyword is likely to lead to a click on your ads. Google Ads takes into account how well your keyword has performed in the past, based on your ad’s position”. In simpler terms, click-through-rate identifies if your ad is using enough keywords matching those you chose in your PPC ad campaign, to make Google users actually click on your ad. It has three statuses – “average”, “above average” and “below average”. First two meaning your ad will perform well among other advertisers, and “below average” meaning you will have to rethink your PPC ad strategy for this keyword – either rewrite your ad to be more relevant to the keyword you chose, or substitute your keyword with another one altogether. Now your landing page experience is measuring what happens after the user clicks on your ad link. To rank high your landing page has to load fast, be user-friendly, and most importantly – relevant. If the user is searching for a “red Ferrari jacket” your landing page should be a page with a number of red Ferrari jackets, not to a bunch of red jackets in general, and not to a bunch of Ferrari products altogether. You can find the full list of things you have to do to optimize for a better landing page experience located here. Keywords are a crucial part of each and every PPC ad campaign, so knowing how to work with your keywords is as crucial as knowing how to breathe. Seriously. Any mistake done within the keyword space and you lose leads, efforts spend and of course – money. So let’s look at how you should work with Google Adwords keywords once you’ve defined them. First of all, let’s exclude all that doesn’t match. A lot of people overlook the power of “negative keywords”. Once you set up the keywords you want to rank for, it’s as important to set up the keywords you don’t want to rank for. For example, if you are selling a product or a service, it’s important to exclude “free” or “cheap”, as it will remove people not looking to buy from your sales funnel. After doing that, type in all the famous mass brands like “walmart”, “kijiji”, “ebay”, “amazon”, and any other company that is a competitor in your niche and overall. Adding negative keywords is a constant process – adding new keywords every month will allow you to save up to 40% of your budget by not appearing in searches not applicable to your business. After you’ve established keywords you don’t want to rank for, you will have to organize the keywords you want to use by match. 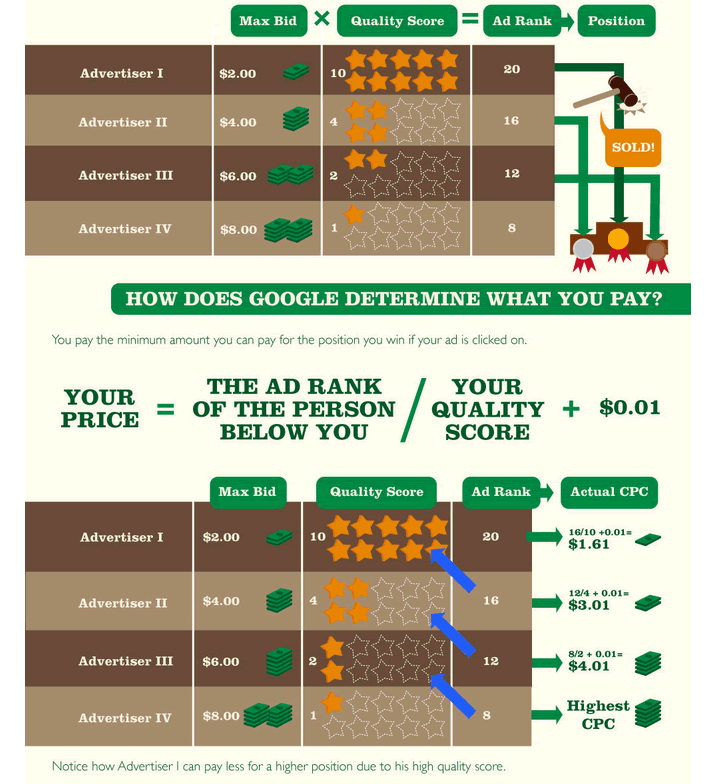 Google Adwords has a way to determine when your pay-per-click ad should be shown. Let’s take the same red Ferrari jacket for example. Broad match. Putting your keywords in a broad match will mean that they will appear in any sentence and any order of words, say Photoshoot in Ferarri jackets, or Ferrari racers wearing red jackets. Not exactly what you are looking for if you aim to sell those jackets, right? This match type can be used for a number of things, but very, very careful. The broad match can also be modified by adding a + in front of the words, so that these keywords appear in the search no matter what. For instance, typing in +red +Ferrari +jacket in your Google Ads interface will make sure that all three words will have to be used to trigger the appearance of your ad. Phrase match. Now, this match type is a little less tricky and yet still extremely useful. Matching by phrase means that all the words from your keywords phrase will have to be used in that exact order. Put your words in the double quotations like this “red Ferarri jacket” and watch your ad get triggered only when people type in “buy red Ferarri jacket” or “red Ferarri jacket price”, for example. Exact match. As you have already guessed, using exact match keywords means your ad will show only when people type red Ferrari jacket and won’t show for “red Ferrari jacket price” or “red Ferrari jacket for sale”. To get this effect, enclose your chosen exact keyword in the brackets like this [red Ferarri jacket] and what your ad appear only when someone types in exactly that. Exact match keywords are said to be searched less, although they are also said to convert and bring the ad viewers to your website much more frequently. Use these digital marketing agency tips and tricks for Pay-per-click marketing to increase your sales, ROI, and overall Google Ads performance.